For decades, New Jersey’s elected leaders awarded one tax subsidy after another to maintain and create good-paying jobs in the state. Or at least that’s what they thought they were doing. Instead, $11 billion in tax breaks has been doled out to corporations with few strings attached and little to show for the investment. The splash of cold water arrived in a new, scathing audit of the New Jersey Economic Development Authority (EDA) that paints a troubling picture of gross mismanagement, negligence, and corporate cronyism at its worst. The audit, performed by the State Comptroller, found that the EDA’s tax subsidy programs operated with little oversight and — even more alarming — have done little to improve New Jersey’s economy. Further, the state failed to properly monitor whether corporations were actually delivering on the jobs they promised to create. 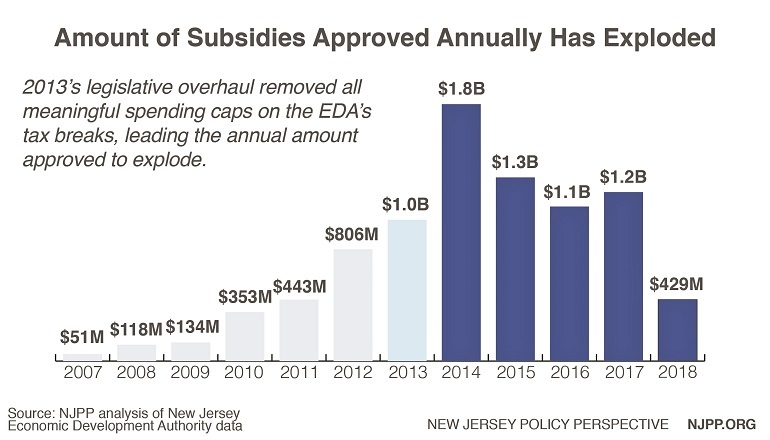 NJPP analysis of the amount of subsidies approved annually by the New Jersey Economic Development Authority. Instead, the EDA relied on corporations to self-report job creation data and, in some cases, did not comply with its own procedures. As a result, corporations received awards they didn’t earn. The comptroller’s audit confirms what New Jersey Policy Perspective and other advocates have been sounding the alarm on for years: New Jersey’s flagship economic development agency provided enormous financial awards to a tiny fraction of the state’s businesses at tremendous cost to taxpayers. In fact, these tax breaks have been ineffective at expanding New Jersey’s economy and, adding insult to injury, have severely limited the state’s potential to improve growth. The hefty price tag of these subsidies has created a damaging cycle of disinvestment that starves New Jersey’s budget and puts the future of the Garden State at risk. Between 2014 and 2018, the state approved $5.9 billion in corporate tax breaks, knee-capping the state’s already compromised ability to meet its obligations or make new investments. And these payouts aren’t going away anytime soon — New Jersey is on the hook for over $4.2 billion in previously awarded tax breaks from fiscal year 2019 to 2022 alone, an average of $1.05 billion a year, according to EDA estimates. That’s billions of dollars in foregone revenue that could have been invested in public schools, NJ Transit, state colleges and universities, and many other areas proven to be great drivers of job creation and economic growth. It’s time to rein in the use of tax breaks for large corporations and turn attention toward programs that are known to stimulate the economy, like workforce development and job training, targeted entrepreneurial assistance, and investments in early education, higher education and mass transit — all of which are proven to offer a much better return on the state’s investment than overly generous tax breaks. If New Jersey is ever going to get serious about rebuilding a path toward solvency, policymakers must first admit they lost control over these tax subsidies. Next, they must find the courage to rebalance the scales before more damage is done to the state’s economy. 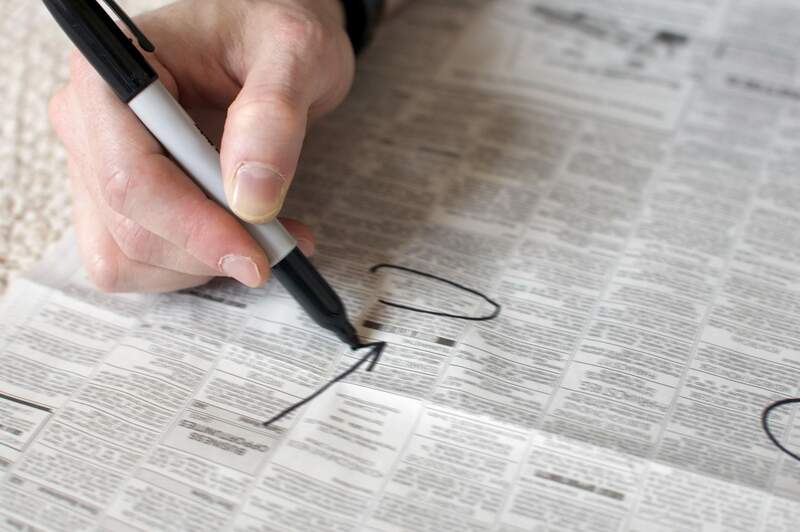 They can start by enacting some common-sense reforms, like restoring the limit on how much New Jersey can spend each year on subsidies and eliminating tax breaks for “maintaining” existing jobs. They should also implement a lower dollars-per-job cap to avoid spending an egregious amount on just a few corporations and jobs. Mandated annual reporting must be better enforced, and a robust and independent evaluation process is needed to determine whether or not future subsidies are delivering the desired benefit. While we can’t go back in time and change what’s happened, we can be clear-eyed about the future and implement reforms that will treat these programs for what they really are — just one tool of many that can help grow New Jersey’s economy. Sheila Reynertson is a senior policy analyst at New Jersey Policy Perspective, a non-partisan think-tank that promotes shared prosperity and widespread economic opportunity through independent research. Her areas of expertise include the state budget, tax policy, and economic development subsidies.